Two scientists from the University of Massachusetts Amherst have created a fabric that can harvest body heat to power small wearable microelectronics such as activity trackers. Though wearable biosensors and data transmitters for personalised health monitoring have been developed, they require a lot of energy, while power sources can be bulky and heavy. The research by materials chemist Trisha Andrew and her PhD student Linden Allison resolves this problem. The work has been supported by the National Science Foundation and by the David and Lucille Packard Foundation. Specifically, they created their all-fabric thermopile by vapour-printing a conducing polymer known as persistently p-doped poly(3,4-ethylenedioxythiophene) (PEDOT-Cl) onto one tight-weave and one medium-weave form of commercial cotton fabric. 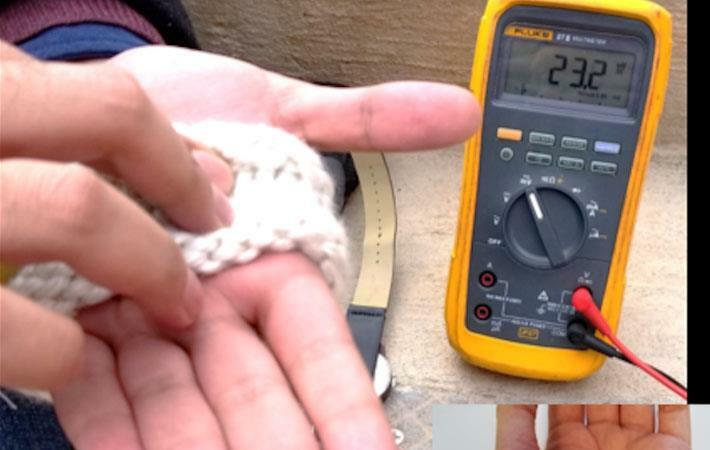 They then integrated this thermopile into a specially designed, wearable band that generates thermo-voltages greater than 20 milliVolts when worn on the hand.